Ah, November - I sure do love all of the anticipation that hangs in your air :). I'm patiently waiting for the Macy's Day parade, all turkey everything, and the "let's see who's quick wit grew the most this year?" family time that Thanksgiving brings. I'm waiting for Thanksmiss, our family's tradition to celebrate Christmas the day after Thanksgiving with my out-of-state fam. I'm also waiting to shop my face off earlier that same morning during Black Friday sales! Woot woot! My first round of anticipation comes today, though. Today marks one month until my birthday! Not just any birthday either - my 30th, to be exact. Most of the people I know dreaded turning 30, but I can't wait! So, back at 23? Most of my friends didn't really find this a good time. At 30? Bring it on! What do I want for said birthday? I want to eat good food with my friends and family -- and maybe treat myself to the gray version of this cardigan ;). It's THE quintessential "fashion blogger" outfit of 2016 and I am all for it. 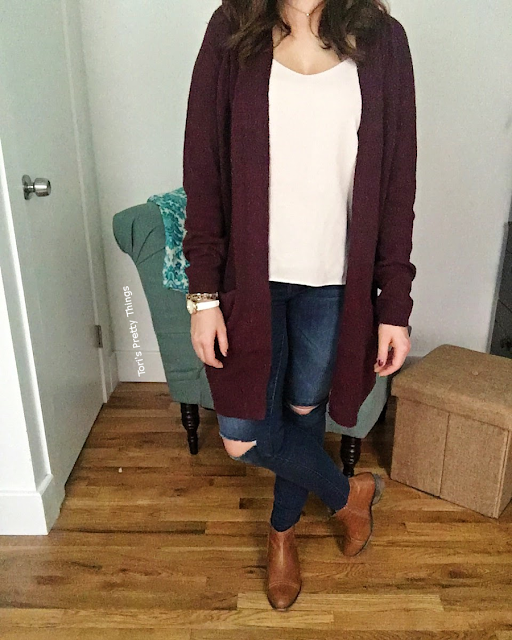 I cannot get enough of this cardigan. I picked it up during the Nordstrom's pre-fall sale back in July and am wearing it non-stop. I'm also loving this v-neck cami trend. I scooped up this one from Forever 21 back in the spring, but I'm really considering picking up this blogger-loved version too. Now tell me - what cozy clothes are you loving this November?